(PantherMedia / subbotina) People often talk about having the flu (influenza) when they come down with a cold. Yet the course of these two illnesses is very different and they also typically have different signs and symptoms. Colds are much more common than the flu. They also start quite slowly, while the viruses that cause the flu strike quickly and cause more severe symptoms – even in people who are otherwise quite healthy. The flu makes you feel very ill quite suddenly. 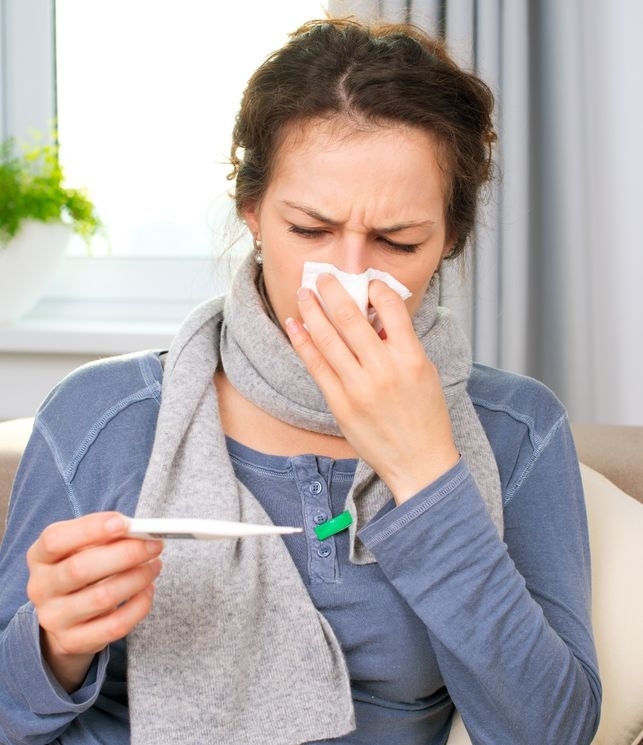 Colds don't usually cause any serious harm, and are often over within a week, with or without treatment. It is a good idea to see a doctor if you have the flu, and it may take some time before you fully recover. But colds and the flu do have one thing in common: The treatment for both focuses on relieving the symptoms. The only medicines that target the flu viruses directly can at most reduce the time you are ill. But a number of things can be done to avoid infection in the first place. Many symptoms of “real” flu are similar to those of a common cold. You might have a fever, headache, achy joints, and a stuffy or runny nose. But flu usually affects the entire body rather than just the airways. It typically starts suddenly with very severe symptoms. These usually improve a lot within one week. Coughing and exhaustion may last longer, though. Babies or young children may also have stomach and bowel trouble like nausea or vomiting. If you think you might have the flu, it is a good idea to go to the doctor. This is especially important if you already have other medical conditions that increase the risk of developing complications – such as a chronic lung disease or diabetes. It is also a good idea to seek medical advice if you have the flu and are in close contact with people who are at high risk. The flu is caused by viruses. Viruses are microscopically small germs – even smaller than bacteria. After entering the body, they multiply very quickly. The body’s immune system needs some time to produce antibodies to fight the viral infection. There are hundreds of flu viruses, belonging to different groups. The influenza A and influenza B viruses are the most dangerous. If you are infected with a particular virus, you will also be immune to that virus once you are better again. Sinusitis (an inflammation of the sinus cavities) is one very common complication of the flu. Here the cavities surrounding the nose fill with infectious fluid. Common symptoms of sinusitis include a headache and a stuffy nose. Babies and young children often develop a middle ear infection when they have any kind of respiratory tract infection. In rare cases, the flu can become more serious and lead to complications like pneumonia. The chances of this happening are especially high in people with a weakened immune system, such as infants and toddlers, people over the age of 60, or people who have a disease affecting their lungs or immune system. Flu and cold viruses are spread through tiny droplets: when someone who is infected coughs or sneezes, droplets containing the viruses are released into the air. Viruses can also spread from a used tissue to someone's hands. These viruses can then pass to other people or objects. They can also be easily transmitted from person to person wherever a lot of people touch the same object, like doorknobs or handrails in a subway car or bus. And cold and flu viruses are more likely to spread if people come into direct contact, for instance if they shake hands or hug each other. The most effective way to protect yourself and others from these viruses is to stop them from spreading – for example, by washing your hands frequently and throwing away used tissues. Even after the symptoms have gone away, you can still be contagious for up to one week. So it is a good idea to avoid contact with others during this period, perhaps by working from home if possible. Flu vaccinations can also provide protection from flu viruses. Many people turn to home remedies like chicken broth and herbal teas to relieve flu symptoms. And getting plenty to drink is also considered to be important. But there is no scientific proof that any of these things helps speed up recovery. So you don't necessarily need to rely on any of the remedies or to drink more fluids than you feel like. A number of freely available products like vitamin supplements or inhalation devices are marketed for the treatment of colds, flus and coughs. But there is no compelling evidence that they are effective against the flu. Painkillers such as acetaminophen (paracetamol), acetylsalicylic acid (ASA, the drug in medicines like Aspirin) and ibuprofen can relieve pain and lower fever. But children and teenagers should not take ASA because in rare cases this drug can cause a serious brain condition in these age groups. In addition to over-the-counter products, prescription-only medication is also available. The most common of these in Germany is oseltamivir (trade name: Tamiflu). Oseltamivir is prescription-only and needs to be taken within two days after the flu starts. It does not have any effect on the course of the flu infection if you have already had symptoms for longer. Some research suggests that oseltamivir could reduce the period of illness by up to one day. But it often causes nausea and vomiting. It is not clear that it helps to prevent complications. Some people think that antibiotics will help in the treatment of flu. But antibiotics are only effective against bacteria, not against viruses. So antibiotics only help if you have a bacterial infection of the airways as well as a viral infection. Unless there are signs of bacterial infection, there is no point in taking antibiotics.